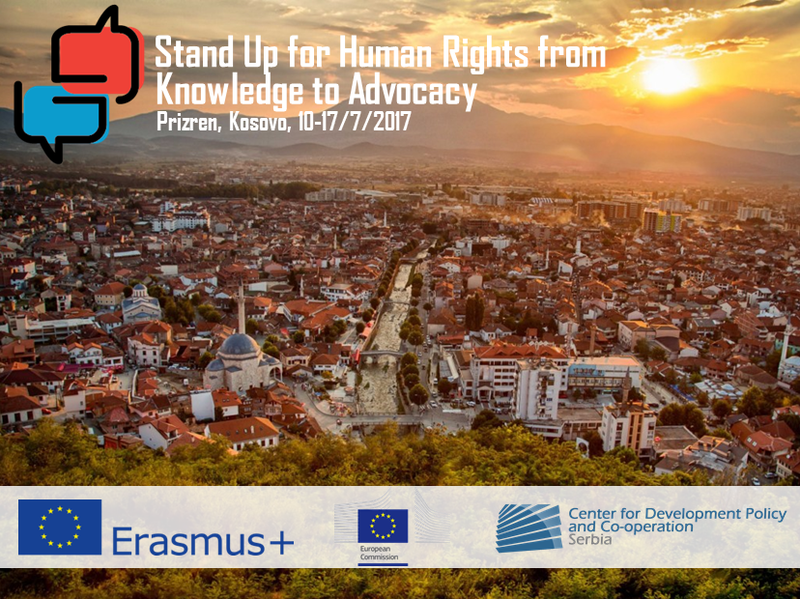 Centar za razvojnu politiku i saradnju (CRPS) ima zadovoljstvo da vas pozove da se prijavite na konkurs za trening kurs “Stand Up for Human Rights from Knowledge to Advocacy” koji će se održati u Prizrenu na Kosovu od 10. do 17. jula 2017. godine. Pravo prijavljivanja i učešća imaju svi mladi iz Srbije starosti od 18 do 27 godina. Prijavljivanje se vrši popunjavanjem aplikacione forme (ispod), za više informacija pišite isključivo na mail konkurs@crps.org.rs sa nazivom mail-a “PRIZREN”. Organizator snosi troškove smeštaja i hrane. Učesnicima će biti refundirani putni troškovi u visini do 180 evra. 04.06.-13.06.2017 (23:59) – Rok za prijave. 13.- 15.06.2017 – Kontaktiranje odabranih učesnika. 15.06.2017 – Rok za uplatu participacije (u iznosu od € 15) za odabrane učesnike. 20.06.2017 – Predstavljanje programa i potpisivanje ugovora o učešću. Project entitle ‘Stand Up for Human Rights: From Knowledge to Advocacy’ is capacity building activity consisting from two mobility activities: two training courses. The project aims in overall to develop competencies of the participants and their organizations to raise awareness on human rights, advocate for human rights and contribute to creating social inclusive society where human rights are being respected by various stakeholders. One of the aim of the project is raise competencies of the participants to use online learning, digital tools and visualization for developing competencies and raising awareness on human rights issues thus part of the activities will also base on methodology based on active using digital tools and visualization to create as many possibilities as possible to strengthen participants interests in these tools. Moreover, the project also aims to provide the participants an opportunity to experience way of creating online learning programs and will include elements of online learning that will be implemented during both training courses. Project activities will be implemented in cooperation of 12 partners coming from Programme and Partner countries (Kosovo, Macedonia, Serbia, Montenegro, Albania, Bosnia and Herzegovina, Germany, Denmark, Latvia, Croatia, Bulgaria and Turkey). Mobiltiy activities will be implemented by the applicant of the project ‘Organization for the Advancement of Alternative Programs’ from Kosovo in Pristina and Prizren. The project is expected to have strong impact on various levels. The impact will be reached especially launching public raising awareness campaign across participant’s countries. The project through implementation of two mobility activities – two training courses aims in overall to develop competencies of the participants and their organizations to raise awareness on human rights, advocate for human rights and contribute to creating social inclusive society where human rights are being respected by various stakeholders. One of the key objectives of the project is to raise participant’s abilities to use online learning, digital tools and visualization in their work.